We help prevent mold and mildew growth - and costly renovations. Ceramic tile and stone are beautiful, durable and versatile finishes, that when properly installed, will provide a lifetime of service with low life cycle maintenance costs. Today's value conscious consumers prefer tile and stone in more areas in their home than ever before and this presents new challenges to traditional installation practices and materials. Conventional substrates, materials, and installation techniques have also proved to be inadequate; therefore, opening the door to moisture penetration. Moisture penetration will cause substrate failure, mold and mildew growth, and costly renovations. Through the years of installation experience, research and testing, The Waterproofing Company has become one of the industry's leading authorities. We supply and install the best waterproofing and uncoupling membranes available - Schluter Kerdi Mat and Schluter Ditra Mat. We install the Schluter Kerdi Drain, a new and innovative system which is fully integrated, creating a water tight seal. We completely eliminate the troublesome and expensive mortar setting bed by replacing it with a custom fit, pre-sloped polystyrene pan that ensures proper tile installation and abolishes substrate failure. We can install the Schluter Kerdi Mat right over existing drywall and our polystyrene pan over 5/8 OSB sub floor. No need for the expensive backer boards or special substrates to ensure reliable installs. 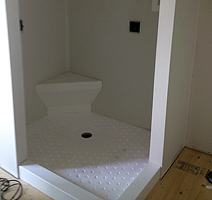 From start to finish, we can install a custom fit shower pan with a curb and drain system, and completely waterproof the shower stall in a matter of hours, ready for the tile to be set the next day. If you're looking to add flare or functionality - or both - to your tiled shower, you'll want to explore your White Matter ® options. Start by browsing photos of benches, seats, shelves, corner mouldings and more in the White Matter ® product gallery and find the perfect fit for your tiled shower. With our patent pending process, we can replace mortar beds with a custom fit, pre-sloped, high density EPS shower pan that is designed specifically to integrate with Schluter Shower System. Any size, any shape. The Waterproofing Company supplies and installs Schluter Ditra Mat. A system that address the problems associated with today's fast, lightweight construction methods, allowing the installation of ceramic tile and stone on virtually any interior or exterior surface. Custom EPS White Matter ® products make shower installation easier than ever, ensuring long-lasting beauty and superb value for investment. Now there are no limits to what you can envision and achieve! Easily add benches, shelves and loungers to your project.